Welcome to the Teacher Locker Series where we will be unlocking the secrets and revealing the perfect combination of resources to have an effective and successful start to the new school year. The first week will inspire those creative juices and help you to start thinking about the Big Picture for this years’ curriculum, including how to plan backward, foster creativity, and plan with purpose so you can get the most from your students. Download the workbook for planning with purpose on week 1. DOWNLOAD our series overview and hang it up by your calendar! You don’t want to miss this series! Buzzwords are used and abused, but this week will unlock the practical uses of the most current Buzzwords and make them Bling! 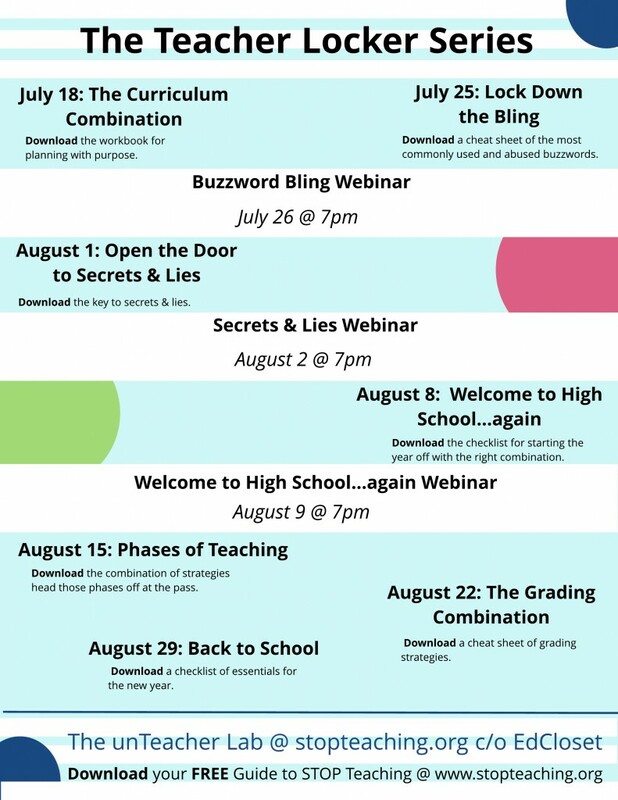 Download: a cheat sheet of the most commonly used and abused buzzwords and register for our FREE Buzzword Bling webinar (July 26 @ 7pm) during week 2. The third week will reveal the secrets and dispel the myths trapped behind the teaching door. During week 3 you can Download the key to secrets & lies and register for our FREE Secrets & Lies webinar (August 2 @ 7pm). The first day of school is closing in and week 4 will help organize, prepare, and collect everything you need to hit the ground running. Download the checklist for starting the year off with the right combination of resources and register for our FREE Welcome to High School…again webinar (August 9 @ 7pm) during week 4. Just like the combination on that locker, the year of teaching has a combination of twists and turns. Whether it is your first year or your 20th year, these phases are inevitable, so we will take a look at them and deliver strategies to make the ride a little less bumpy. During week 5 you can Download the combination of strategies head those phases off at the pass. The grading is going to pile up fast, so we are going to take a look at ways to reduce, reuse, and recycle that grading. You can Download a cheat sheet of grading strategies during week 6. In the Final week, we will ring in the new school year with a New Year’s countdown! Download a checklist of essentials for the new year during this week. Whether this is your first year at a new high school, 10th year at the same high school, or first year EVER, this series will give you the combination to open that teacher locker series and pull out everything you need to get ready for the year. Every week you will have access to FREE ready to use downloads, checklists, and cheat sheets. We will also have 3 FREE live webinars so we can have a little face-to-face time to answer questions and practice using the resources. Don’t forget to check out my Breakout Session: Coaching Teachers through the Arts Integration Process at this Summer’s Connectivity Conference!